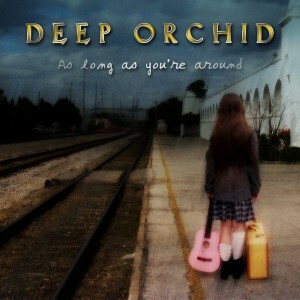 Deep Orchid Album Cover Art – where is that?! Quietly, standing at the train station platform; anxious and waiting with a one way ticket to anywhere.. The intense mood and scene created for the Deep Orchid cover artwork was created by producer, Peter Chang. The image is the blending of two separate images intricately forged to create the ideal sense of a wayward traveler with nothing but bits and pieces of time. The background image is the platform at Orlando Central Station in Florida, USA. The young girl is photographed from behind, standing in the front yard at home, miles away. Peter, cropped and superimposed her onto the background and carefully detailed the images until the two became one. Hauntingly representative of a lost traveler, though sure she knows she has to arrive somewhere soon. Check out the two original images.